• Capable of 25 Watts of Power Dissipation. 2N5401 PNP Transistor Plastic-Encapsulate Transistors View Secos Corporation. BCP51-16 -1A , -45V PNP Plastic Encapsulate Transistor View Secos Corporation. BC807-16 -500 mA, -50 V PNP Plastic Encapsulate Transistor View Secos Corporation. 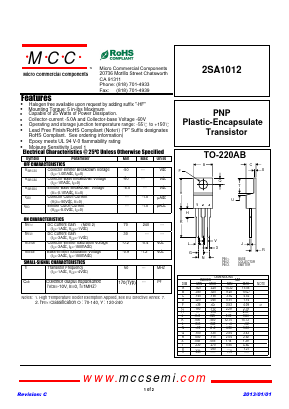 BC807-16W -500 mA, -50 V PNP Plastic Encapsulate Transistor View Secos Corporation.